Nearly 200 people took to the streets of Liverpool to fight cancer and raise money for ‘Maggie’s Merseyside’ centre. 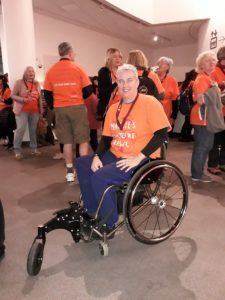 The Culture Crawl, which raises funds for the cancer facility based in Clatterbridge Hospital, gave participants the chance to see the city in a new light as they walked 10km with exclusive night-time access to some of town’s most iconic venues. 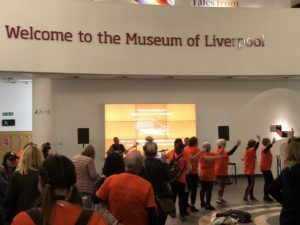 This year’s visits included trips to Liverpool Cathedral and Victoria Museum and Gallery, finishing up at the Museum of Liverpool, where participants celebrated the event with a dance. Maggie’s Merseyside prides itself on being a place that offers free emotional and practical support for people living with cancer, and also for their loved ones. Kathy Wright, Centre Head at Maggie’s Merseyside, told JMU Journalism: “The Culture Crawl is one of our biggest fundraising events in the calendar, which helps to keep our doors open to people affected by cancer. “Some walked in celebration and others walked in memory of loved ones, making it an extra special evening. Anna Jackson, an ambassador for Maggie’s at Clatterbridge Hospital in Wirral, first got involved with the charity when her partner, Karen Illston, was diagnosed with cancer in 2017. Karen received three months of treatment at Clatterbridge, as well as ongoing emotional support for herself and Anna. Miss Jackson said: “Cancer is not something you ever want to enter your life, but we have met some amazing people on our journey and made some really special friends. All of the money raised through Friday’s Culture Crawl will help Maggie’s Merseyside continue to provide professional support to those that need it and also help towards opening a new centre.